Come to the cabin to a warm plate of chocolate chip cookies and relax and sit back in one of our small 2 bedroom cottages overlooking Lake Florida near Spicer, MN. There are two other similar cottages next to this one that are terrific. Vaulted ceilings, and a well furnished kitchen makes this cabin cozy but not too small. Windows overlook the beautiful calm waters of Lake Florida. Cabin comes with well maintained window flower boxes, well maintained lawn and clean beach. Each cabin comes with a picnic table and chairs. 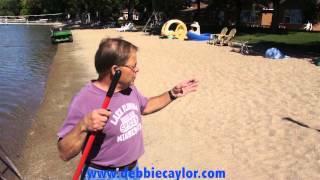 Dickerson's Resort is a family run lakeside resort that is warm and friendly. The organized evenings provide a relaxing retreat for the adults and kids love the wagon rides, warm donuts and docks to fish off. The playground equipment and beachside swing provide many hours of entertainment. Even though your vacation should remain relaxing, we all understand the occasional check-in with the outside world so we provide complimentary Wi-Fi all over the resort. Kathy Lucas— 5 star. Great week with kids and grandkids. Minimal rain, beautiful lake, grounds overflowing with colorful flowers, friendly gracious proprietors, lots of memories! Thank you Bob and Connie. Gretchen Sheatsley Peik — 5 star. Wonderful week at Lake Florida! Lots of rain and even more fun:) This was our seventh year but our first time to come in June. Our "grands" have grown up at Bob and Connie's. We will be back next summer! It's a magical place! Heidi Schneider — 5 star. Wonderful hospitality, thank you! You made us all feel so welcome with chocolate chip cookies, beautiful cabin, and gorgeous sunsets on the lake. Perfect place for our autumn writers' retreat.